Royal colors (4 each - mountain jade, blue, tangerine, natural and red). 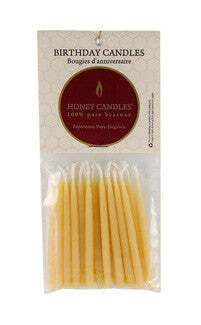 Made with 100% pure Canadian beeswax, Honey Candles® use only cotton or paper wicks, with no toxins or harmful ingredients, zinc and lead-free. Handmade and classically dipped. Best of all, beeswax birthday candles won't drip all over your birthday cake! Try these beeswax birthday candles and you'll never go back to paraffin birthday candles!